It's all about the braid. At last, all those plaits your mum used to do in your hair as a kid, finally have a proper place in your life. And it’s shining bright, we can tell you that. Braids are all the rage all over the world, including some old favourites. Let’s get into one of them, with the classic French braid. Step 1: Prep your hair. Braids involve a lot of pulling and tugging on your hair so you want your hair to be strong protected. For this we recommend your wash your hair with the TRESemmé Platinum Strength Shampoo and Deep Treatment Conditioner. Step 2: Braid your hair. Comb your hair back and section off a piece at the top of your head. Divide the top piece into three and begin to braid. When braiding, each of the side braids should go over the middle braid. Then, as you are braiding drop off a piece on the side and take another piece of hair on that same side by running a finger through your hair. Add this sectioned off piece to the braid, over the middle piece. Do the same to the other side. Repeat these steps until you reach the end of your hair and tie with a small elastic band. Step 3: The end result. Braids are all the rage all over the world, including some old favourites that have been revamped and launched the limelight by celebs such as the Kardashians. Let’s get into one of these, the trending Dutch braid. Step 1: Prep your hair. Braids involve a lot of pulling and tugging on your hair so you wan your hair to be strong protected. For this we recommend your wash your hair with the TRESemmé Platinum Strength Shampoo and Deep Treatment Conditioner. Step 2: Comb hair back and section off a piece at the top of your head. Divide the top piece into three and begin to braid. When braiding, each of the side braids goes under the middle braid. Step 3: As you are braiding, drop of a piece on the side and section off another piece of hair on that same side, by running a finger through your hair. Add this piece to the braid, under the middle piece. Do the same to the other side. It’s a bit difficult at first, but be sure to keep the braid pulled tight. Repeat these steps until you reach the nape of your neck. Once there, bring the braid over your shoulder and braid it like a regular plait and tie it off with an elastic band. Step 4: Put the finishing touches. To tame any flyaways, use TRESemmé Salon Finish Firm Hold Hair Spray. And there you have it. A revival of an old classic, good enough tor rival the Kardashian’s themselves! One of our personal faves is the lace braid, so we’ve out together an easy-to-follow tutorial on how to get this look. It’s just so pretty and suited for any casual or smart-casual event - and it looks sophisticated enough that everyone will be asking about your hairstylist. Step 2: Begin braiding. Now that your hair is clean and dry, make a side parting in your hair all the way to your crown area. Take a small section from the front of the hair and separate it into three equal pieces, ready to braid. Pass the bottom piece of hair over the middle piece, and then the top piece goes over the middle piece. Repeat two or three times. 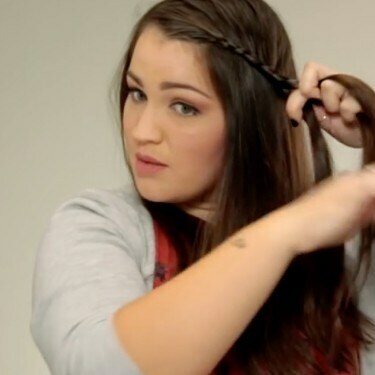 take another piece of hair from next to where you are braiding, and add it to the braid. Repeat this step. Remember that the difference between this lace braid and a regular braid is that with this brand you add in sections of hair from the top of your head (next to your parting). repeat this step until reach the end of your parting. Step 3: The end product. Continue the braid as a regular braid until you reach the end of your locks, and tie it off with a small elastic band. To tame any flyaways, we recommend you use the TRESemmé Firm Hold Spray. It will do the job while keeping your look natural. Being sporty doesn't mean boring hair. Elevate your ponytail to the next level with this Sporty Chic hairdo.